For the past four years, I have been the advisor to our school's French Club. Before starting the club, I met with veteran French teacher Susan Frost of Lake George, NY, to get some ideas. This post is comprised of both my own ideas and those of Susan's that I've had success using. The Focus of the Club - This may seem fairly obvious, but the focus of a French Club can take many forms. Will this be an immersion club where only French is spoken? 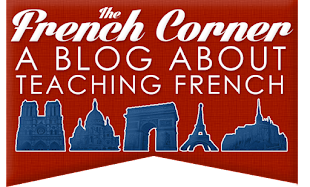 Will the goal be to learn more French or will it be focused more on culture? Will you have many different activities or just one or two ongoing activities? I made the decision to focus primarily on culture and secondarily on language, since I find this to be a nice supplement to what we do in class. By not insisting on French being spoken all the time, students with little to no background in French can still come and enjoy our activities. Who Can Join the Club - My building has students in grades 6-8, but only students in grades 7 & 8 take a language. I made the decision to allow all students, regardless of grade or enrollment status in French, to attend French Club. My rationale for this is that one need not be enrolled in French to learn about it and to broaden one's horizons. Even students studying Spanish sometimes attend meetings, because they are interested in what we are learning about. This does mean, though, that some students will attend the club for 3 years, so I make an effort not to do exactly the same activities every year (although anything involving food is a slam dunk and students are happy to repeat it). How Often The Club Will Meet - Many after school clubs meet once a week, but after meeting with Susan and talking to other French Club advisors, I realized that once a month is a more appropriate frequency for a club of this nature. Each month, there is a different focus, and students are informed ahead of time of what the meeting will be about so that they can decide if they want to come or not. If we are doing an extended project, then we will meet more frequently to work on that as needed (see below for what some of those projects are). How You Will Inform Students About Meetings - I try to meet the same week of each month, but with field trips, long weekends, and vacations, that doesn't always happen. Both I and the other French teacher inform our students ahead of time of each meeting, but since the club is open to all students, I also have an announcement made the day before and the day of on the morning announcements. I also post about it on Edmodo. One way or another, you'll want to make sure your students are well aware of any meetings to they don't miss out if they want to attend! The first meeting - I like to use the first meeting to introduce students to the club. Although 6th graders are invited to attend along with the older students, a majority of the members begin attending in 7th grade as French students. I tell them what we've done in years past, and then ask students to provide ideas for the coming year. Some of our greatest projects were ideas from students. I invite students to bring French/francophone food to the meeting that's easy to share, since refreshments always draw a larger crowd. Above are mini croque-monsieurs that a student brought in to share. 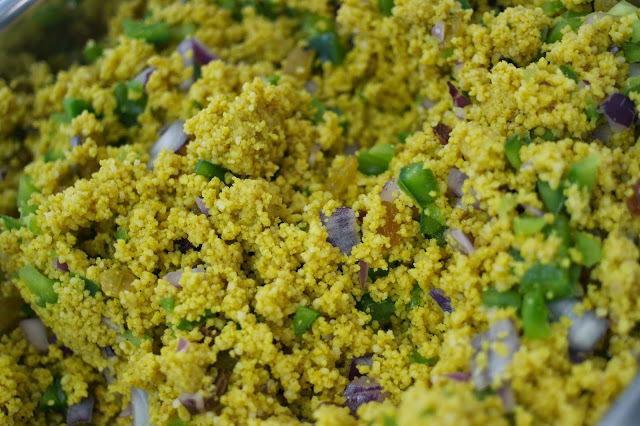 They are divided into traditional and vegetarian, and they're even gluten free! Students always come up with the neatest things. I never would have thought of this! 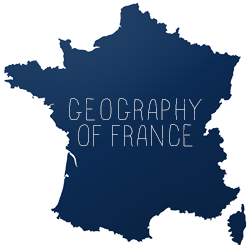 If there's any time left at the end of the meeting, I have a little Kahoot game that we play with trivia about the French-speaking world (questions cover topics such as which countries and organizations use French or which teachers' last names are French). 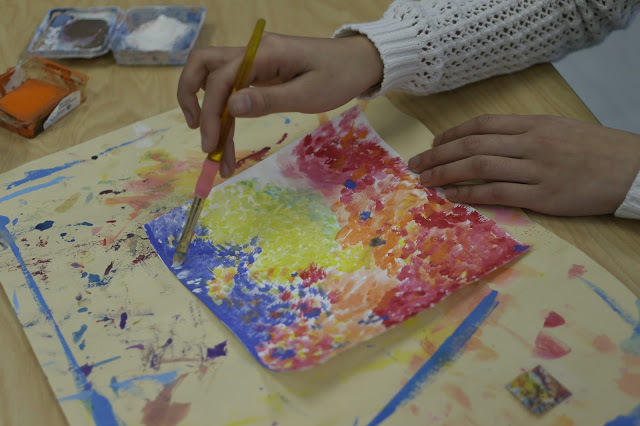 Impressionist Art Project - On two separate occasions, the French Club teamed up with the Art Club to recreate an Impressionist painting. One year we did Seurat's Eiffel Tower, and another year we did Van Gogh's Starry Night. Students recreated a portion of the painting on a small square, and the squares were then put together to make a mural. A project like this takes a few meetings to accomplish, but the nature of it is such that students can attend any or all of those meetings in order to collaborate on the project. I admit, I was mostly here for "moral support" and bus pass writing during these meetings, as I'm not much of a painter. The two art teachers I worked with were the genius behind the project! 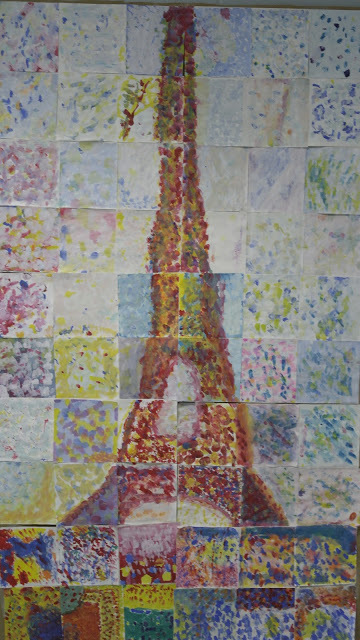 To learn more about how I incorporate Impressionism into my classroom, click here. Cards for hospital patients - Thanks to Susan for this wonderful idea. Every year I have a meeting where students write cards for patients in the Montreal Children's Hospital. They are not personalized towards anyone in particular, but they all contain various well wishes in French. 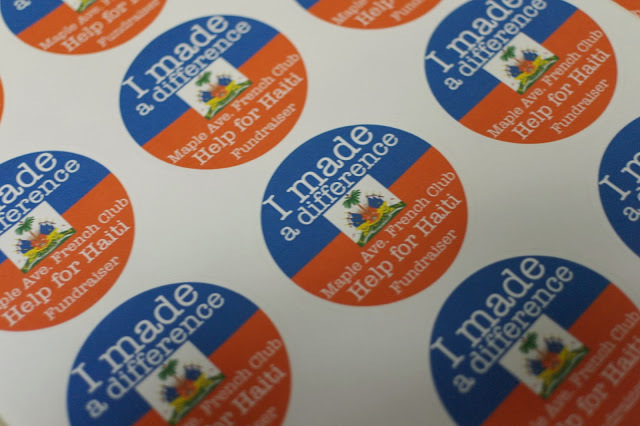 Fundraiser - A few years ago we did a fundraiser to benefit the children of Haiti. Students sat outside the cafeteria during lunch periods collecting donations. Anyone who donated got a sticker. They also asked friends and family at home to contribute. In the end, we donated the funds to the UNICEF Haiti Fund. Mini bûches de Noël - Another great idea from Susan Frost. Although it would be great to make a seasonal dish such as a bûche de Noël, the time available after school is too limited to take on a project like that. Enter the mini bûche de Noël! It may not be as authentic, but it introduces students to the dish nonetheless. First, we look at photos of bûches de Noël, since they can look so different. Then, we watch a video showing one being rolled. 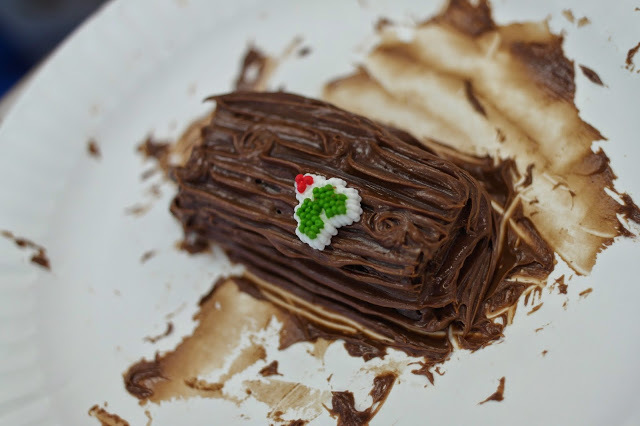 Finally, students make their own mini bûches de Noël using Swiss rolls, frosting, a fork to make the bark texture, and little holly decorations. In class, students can bring in real bûches de Noël, along with other dishes, the day before December break. Donate a dish - One year a student suggested we make a francophone dish and donate it to the local soup kitchen. We made a Moroccan couscous salad. Local grocery stores donated some of the ingredients. Valentine's Day Hearts - This idea was adapted from a post I saw on the wonderful French Teachers in the US Facebook group. 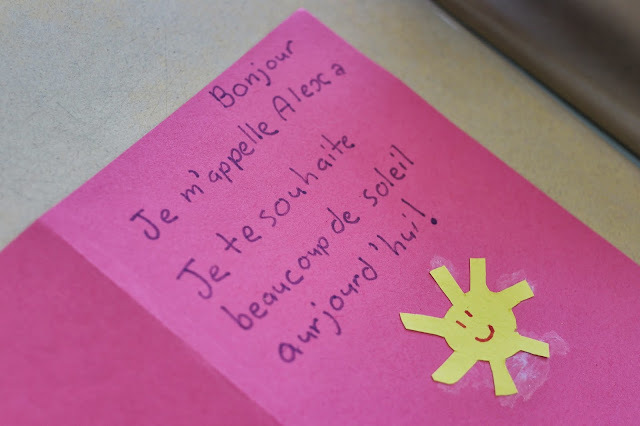 The other French teacher and I pre-cut hearts for students to write friendly messages on in French (Joyeuse St-Valentin, Tu es magnifique/fantastique, etc.) during French Club. They then hung them on the lockers around the school. An announcement was made for students to see a French student to find out what the message meant (which was the wonderful idea of the poster on Facebook). One caveat for this is that it is incredibly time consuming if you have a large school. My school has around 1600 students, and this task ending up taking quite a bit longer than expected. Luckily between the French teacher and I and a number of French Club students who were willing to put in some extra time to get them all up before Valentine's Day, we accomplished the task. Cheese tasting - The tried-and-true cheese tasting event is always a winner, and we repeat it every year. I give students a list of French cheeses that are easy to find, and students can sign up to bring some in. Before we eat the cheese, we watch a quick introductory video. Collaborate Across Schools - This past year, middle school French Club students had an opportunity to Participate in World Cultural Night at the high school. At this event, high school students studying language at the upper levels present something cultural - be it food, a game, a performance, etc. The public is invited to attend. The French Club students split into two groups and presented on cheese (something they learned about at one of our meetings as well as in class), and French film titles. The cheese group gave out the survey above for visitors to take home to remember which cheeses they liked. The French film group made a Kahoot game based on the films on the poster below (the flaps lift up to reveal the title in French). As visitors pass by, they can play the game (2-4 people at a time). The winner got a cream puff. This was a great way for these students to get to participate in a high school environment and see what awaits them down the road. It's always great to collaborate across levels! 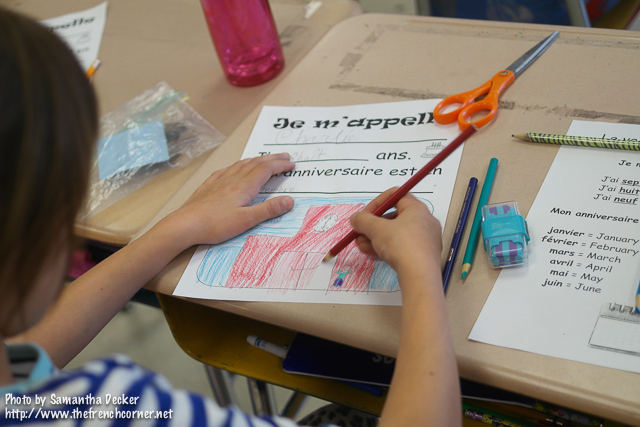 Elementary Teachers - For the past two years, French Club students have gone into elementary classrooms to teach mini lessons to the students. French Club students who participated in the project came in after school on a number of different occasions to prepare lessons and create visuals and examples. Students practiced the lessons on each other, and we discussed some scaffolding and classroom management techniques. For the first two lessons, my colleague and I developed the agenda, but for the third and final lesson, the students gave their input. The project has been one of the most rewarding I have ever done with students. You can read about it in detail in this post. Sidewalk chalk - For National French Week this past year, students in French club drew flags of French speaking countries with sidewalk chalk on the front entryway to the school. I got the idea from a teacher at a NYSAFLT Conference who said she took her elementary students outside with sidewalk chalk. Well, middle schoolers like sidewalk chalk too! You can read more about my National French Week activities in this post. 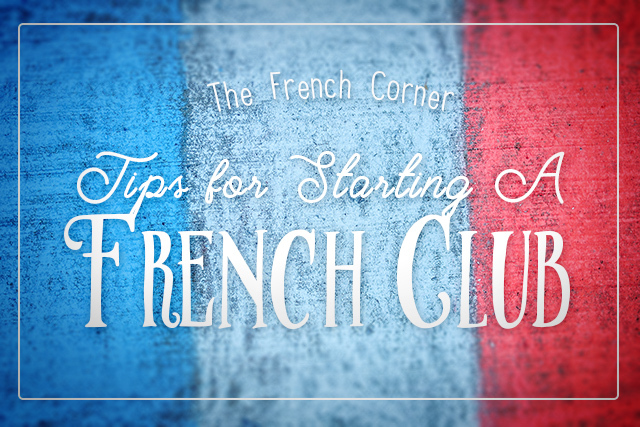 I hope you find these ideas helpful if you're planning to start up a French Club this year. What are some of your favorite French Club activities? I enjoy discovering new ideas for my students from your posts. Thanks for sharing! One thing my students enjoy is an Eiffel Tower contest. I divide my club members into groups of 2 or 3 and have them create an Eiffel Tower. Each group is given a package of sugar wafers, a tub of icing, and some blue and red sprinkles or candies. Then they have 20 minutes to work. When I call time each group must stop work. At this point each participant is given 3 vote cards - most realistic, tallest, most original. They are given a few minutes to go around, look at the various creations, and place their votes. Winners are given some blue/white/red string and a small Eiffel Tower charm to make a little necklace (but I usually have enough for everyone to make a necklace). Thanks for sharing this idea Elizabeth! I like the voting method for the contest. Thanks a ton, just loved your blog and your creative ideas. It's helping me a lot. Looking forward to get some help from you, to improve my lessons. Myself Sabitha. working in Gems school, UAE.